LWV of ASHLAND and BAYFIELD COUNTIES is very proud of their board member and Issues Advocacy Chair Joan Elias, who recently received the Karen Danielsen Outstanding Stewardship Award presented by the Superior Rivers Watershed Association for her vision and leadership having founded the group in 2002. The idea of a watershed council in the Chequamegon Bay area was enthusiastically supported by the League and with their backing, Joan formed a group of dedicated collaborators including federal and state agencies, NGOs, local towns, and the Bad River Band of Lake Superior Chippewa to address a wide range of natural resource concerns and especially the need for water quality data. 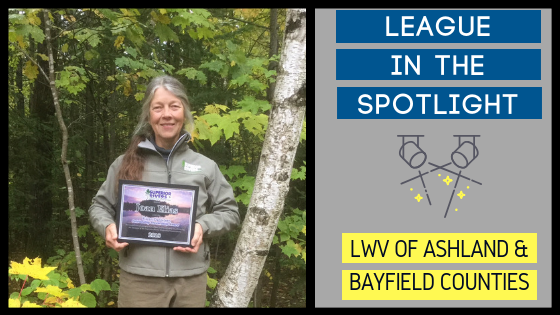 One League member standing strong helped create a needed environmental service that, over the years, has only grown and continues to train and work with volunteers who collect water chemistry, macroinvertebrate, stream assessment, and temperature data in an area of 2,700 miles of streams in Ashland, Bayfield, and Iron counties. Read the full story here. Fellow LWV ABC board member Linda Jorgenson remarked, “We may have thought they were ‘nerdy citizen scientists’ monitoring the water quality of our streams and worrying about brook trout, but we have them to thank for installing new culverts, stabilizing stream banks, developing tree and vegetative cover, and educating all of us about the importance of protecting our water quality. All this mitigated some of the recent storm damage.” The League applauds citizen advocate Joan Elias!